Flickr/arnold inuakiLe Bernardin hits the spot. It ranked No. 1 on our list of Best Restaurants in America. We recently released our list of the Best Restaurants In America. 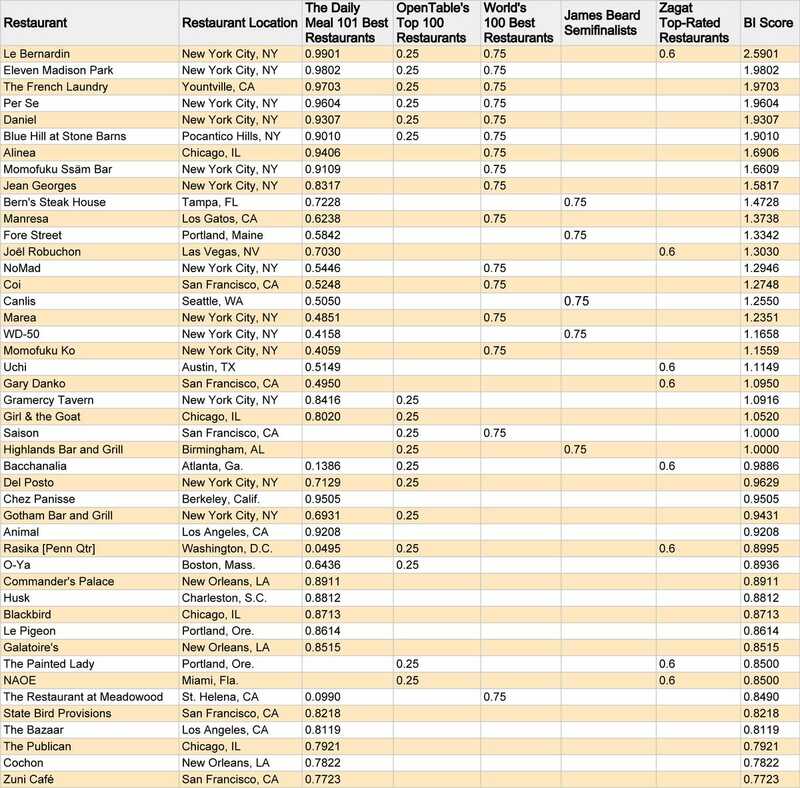 We compiled this list by looking at five major restaurant rankings made by food critics, diners, and experts, and giving each restaurant a score based on how many times it appears on each list. The rankings we used were The Daily Meal's 101 Best Restaurants in America, OpenTable's 2013 Diners' Choice Top 100 Best Restaurants in America, The World's 100 Best Restaurants, the James Beard Foundation's 2014 Restaurant and Chef Award Semifinalists, and Zagat's 20 Top-Rated Restaurants Across America. For The Daily Meal's list, which was ranked 1 to 101, we calculated the score by using the following formula: 101-X (restaurant ranking) / 101. With this formula, the highest possible score is 0.99 and the lowest score is 0. Each time a restaurant appeared on the OpenTable list, we gave it a score of 0.25, since the 100 restaurants on that list were not ranked. Because the World's 100 Best Restaurants looked at restaurants around the world and only 16 American restaurants made the list, we valued that list higher and gave each U.S.restaurant that made the list a score of 0.75. We also valued the James Beard Awards higher since they are considered the most prestigious awards in the food world, and there were fewer semifinalists. We gave the 30 semifinalists who were nominated for "Best New Restaurants" in 2014 a score of 0.60. We gave the 20 semifinalists who were nominated for "Outstanding Restaurants" a score of 0.75, since those restaurants must have been open for at least 10 consecutive least years and have attained a high level of excellence throughout their tenure. Each time a restaurant appeared on the Zagat list, we gave it a score of 0.60, since there were only 20 restaurants included and the list was not ranked. We then tallied up the scores to create the final ranking. Based on these calculations, the highest possible score would be 3.34 - but that would be incredibly difficult, considering that even the number one restaurant (Le Bernardin) scored a 2.59.